Inscribed on the base, "ADRIANUS FRIES HAGUENSIS FECIT". This rearing horse's two rear legs, upon which he balances his powerful bulk, serve as the sole support for the body of this large animal. Pawing the air and tilting his head to the left, the horse electrifies the space around him. The sculptor Adriaen de Vries further suggested the animal's vitality through the open mouth, flaring nostrils, and protruding veins on its belly. The horse's lack of shoes suggests that this is a stallion kept for stud. De Vries executed more than a dozen bronze statuettes of horses and horses with riders, only four of which survive or are securely identified. This is one of the rare signed ones. 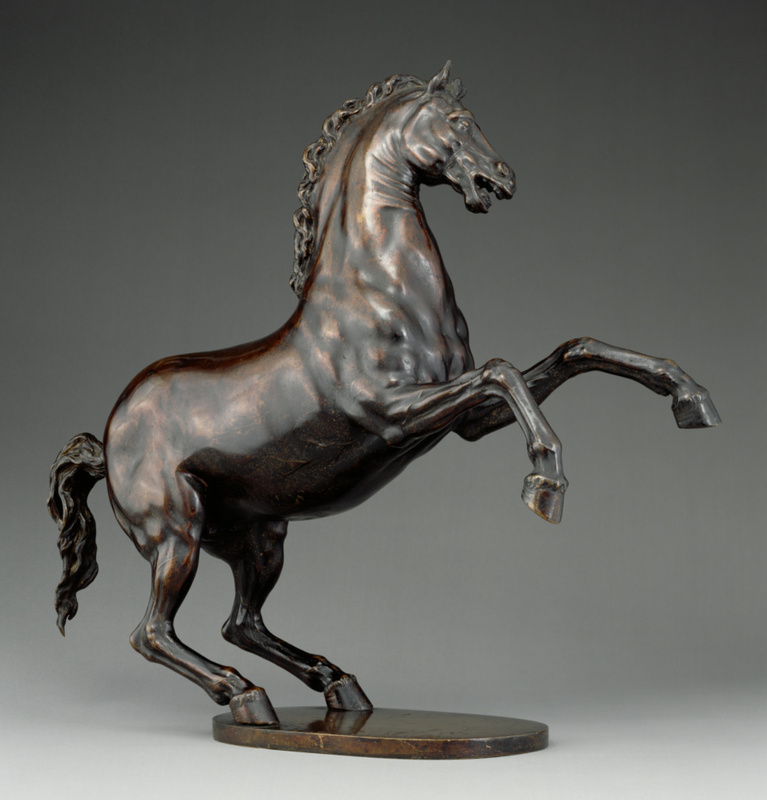 The horse's daring pose makes it a tour de force of bronze casting, and the beauty of its patina, or surface treatment, testifies to the artist's reputation as an exceptional bronzemaker. Antoine Brun, baron d'Aspremont, French, 1599 - 1654, possibly by inheritance to his son, Claude Ferdinand, marquis de Brun, 1664. Claude Ferdinand, marquis de Brun, French, died 1716, by inheritance to his son, Agalange Ferdinand, baron de Brun, 1716. Agalange Ferdinand, baron de Brun, French, died 1746, by inheritance to his heirs, 1746. Same Art Ltd., sold to the J. Paul Getty Museum, 1986. Denucé, Jean. Bronnen voor de geschiedenis van de Vlaamsche kunst. Vol. 2, De Antwerpsche "Konstkamers": inventarissen van kunstverzamelingen te Antwerpen in de 16e en 17e eeuwen (Antwerp: De Sikkel, 1932), p. 190 ("Inventaire de la reine Christine de Suède, mai 1656," Notaris J. S. Le Rousseau, Protocollen 1656, fol. 270-289). Collections privées de Franche-Comté: peinture, dessin, sculpture, exh. cat. (Besançon: Musée des Beaux-Arts, 1979), p. 19, no. 88. Etude Couturier Nicolay,Hôtel Drouot, Paris. Dessins, aquarelles, tableaux anciens, tableaux du XIXe siècle, meubles et objets d'art, tapis, tapisseries. December 12, 1984, lot 78, ill., cover ill.
Leithe-Jasper, Manfred. Renaissance Master Bronzes from the Collection of the Kunsthistorisches Museum Vienna, exh. cat. (Washington DC: National Gallery of Art, with Scala Books, 1986), p. 242, under no. 64. "Acquisitions/1986." The J. Paul Getty Museum Journal 15 (1987), pp. 219-20, no. 121, ill.
Larsson, Lars Olof. "Bildhauerkunst und Plastik am Hofe Rudolfs II." In Prag um 1600: Kunst und Kultur am Hofe Rudolfs II., exh. cat. Jürgen Schultze, et al., eds. (Essen: Kulturstiftung Ruhr, Villa Hügel, with Luca Verlag, 1988), vol. 1, pp. 134-35, fig. 7. Schultze, Jürgen, and Hermann Fillitz, eds. Prag um 1600: Kunst und Kultur am Hofe Kaiser Rudolfs II., exh. cat. (Vienna: Kunsthistorisches Museum; Freren: Luca Verlag, 1988), vol. 2, pp. 68, 73, no. 538, ill., entry by Manfred Leithe-Jasper; p. 69, pl. 5. The J. Paul Getty Museum Handbook of the Collections. 3rd ed. (Malibu: J. Paul Getty Museum, 1991), p. 210, ill.
Larsson, Lars Olof. European Bronzes 1450-1700 (Stockholm: Swedish National Art Museums, 1992), p. 88, under no. 31. Heithorn, Uwe. Firnis und Patina: Studien zur Oberflächenbehandlung mitteleuropäischer Bronzeplastik um 1600. Ph.D. diss. (Christian-Albrechts-Universität zu Kiel, 1994), pp. 89, 208, 228, fig. 23. The J. Paul Getty Museum Handbook of the Collections. 4th ed. (Los Angeles: J. Paul Getty Museum, 1997), p. 252, ill.
Fusco, Peter. Summary Catalogue of European Sculpture in the J. Paul Getty Museum (Los Angeles: J. Paul Getty Museum, 1997), p. 54, ill.
Scholten, Frits, et al. Adriaen de Vries, 1556-1626: Imperial Sculptor, exh. cat. (Amsterdam: Rijksmuseum, with Waanders, 1998), pp. 99, 166, under no. 20, entry by Frits Scholten; pp. 169-71, no. 21, ill.
Fusco, Peter, Peggy Anne Fogelman, and Marietta Cambareri. Masterpieces of the J. Paul Getty Museum: European Sculpture (Los Angeles: J. Paul Getty Museum, 1998), pp. 46-47, no. 14, ill., entry by Peggy Anne Fogelman. Cavalli-Björkman, Görel. "Adriaen de Vries's Horses: An Imperial Prerogative." Art Bulletin of Nationalmuseum Stockholm 6 (1999), pp. 71-72, fig. 11. Berger, Ursel, et al. Adriaen de Vries 1556-1626: Augsburgs Glanz - Europas Ruhm, exh. cat. (Augsburg: Städtische Kunstsammlungen, with Umschau Braus, 2000), pp. 91, 249, under no. 18, entry by Frits Scholten. Slive, Seymour. "Collecting 17th-Century Dutch Art in the United States: The Current Boom." Bulletin van het Rijksmuseum 49, no. 1 (2001), p. 89, fig. 7. Bewer, Francesca. "The Sculpture of Adriaen de Vries: A Technical Study." Small Bronzes in the Renaissance, Studies in the History of Art, Symposium Papers 39 Debra Pincus, ed. (Washington DC: National Gallery of Art, with Yale University Press, 2001), pp. 174-75, figs. 22-23. The J. Paul Getty Museum Handbook of the Collections. 6th ed. (Los Angeles: J. Paul Getty Museum, 2001), p. 252, ill. The J. Paul Getty Museum Handbook of the Collections. 7th ed. (Los Angeles: J. Paul Getty Museum, 2007), p. 199, ill.
Bassett, Jane, et al. The Craftsman Revealed: Adriaen de Vries; Sculptor in Bronze (Los Angeles: The Getty Conservation Institute, 2008), pp. xiii, 29, 118-24, 132, 270-71, 290, figs. 15.1-9. Bassett, Jane. "Adriaen de Vries, Master Craftsman: Aspects of the Artist's Technique." In Neue Beiträge zu Adriaen de Vries: Vorträge des Adriaen de Vries Symposiums vom 16. bis 18. April 2008 in Stadthagen und Bückeburg. Sigmund Graf Adelmann, and Dorothea Diemer, eds. (Bielefeld: Verlag für Regionalgeschichte, 2008), p. 202.